You don't need to give your cavies baths daily or even weekly baths, but it can be beneficial to give them an occasional one. You have to bath them because it may be that you feel their colours are looking a bit dingy, or they have become stained, or the coat has become greasy. Cavies can also become afflicted by a parasite mite that lives on the hair. These mites can be very persistent and, although they do not seem to harm the guinea pig, it is good to get rid of them. The best time to bath your cavy is a warm day if you can and, if you have more than one cavy to bath, I would suggest that you bath them the same day. This is for several reasons. When you bath your cavies, you will remove some of their individual scent. If you only bathed one cavy, there is a possibility that the other animals would not recognise its smell, and may start to fight. Also, if one is clean and the other snuggles up to it when dirty, you will be back to square one, having two dirty cavies again. There are alot of chooses for shampoo, you can use any shampoo that you would use yourself or you can use shampoos manufactured for imppies and other small animals. Shampoos designed for ridding dogs of fleas can also be tried, as can herbal shampoos for the elimination of lice. You can also use shampoos that are used on human hair to clear head lice (available from chemists). The items you need for the bath are: Bowls of warm water, towels and shampoo(you can also use a hairdryer). I find that it is easiest to use a fairly deep sink and a deep bowl, as the cavies seem to be more settled in deeper water than in a very shallow bath. Thoroughly wet the cavy all over by lowering him into the water, supporting his head with your hand so that he does not drown. Then lift him out on to the side and work the shampoo into the coat, remember the tummy, around the legs and under his chin. Avoid getting the shampoo into the eyes - it will sting just as it does in your own. Wash inside the ears with shampoo, as mites can live in the ear wax. When you have worked up a good lather, rinse the cavy and, if you wish, add a little more shampoo and do it again. 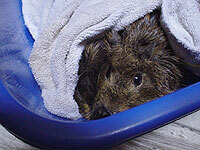 Rinse the cavy thoroughly in at least two fresh amounts of water, then lift it out of the water and wrap it in a towel. I find it easiest to have the towel ready folded in half down its length, and roll the towel round and round the animal leaving just its head poking out. I then leave the cavies to dry off for several minutes and then, using a dry towel to sit them on, I start to comb the cavy and use the hairdryer to get it completely dry. If you gently brush the hair in the opposite direction from the way it naturally grows and let the warm air blow through, you can get the cavy dried t:lirly quickly. Do keep the hairdryer moving all the time and do not have it on a high temperature. Avoid letting the air hurt the cavies' ears, as they do not have hair on them and could easily get burnt. Fnish by giving a gentle brush in the direction the hair naturally grows. It can he a useful time to trim the cavies' nails after they have had a good soak, as the nails become softer in the water. On a warm day the cavy can be returned to the hutch as soon as it is dry. However, if it is wet or chilly outside, it is better to allow it to stay indoors in a box for a few hours, or even overnight, so that it doesn't get a chill. It's best that you clean the cage before you put your cavy back so he won't get dirty again.